Adventure, Art, Culture: Ancient Egyptians have nothing on the Neolithic Irish. Ancient Egyptians have nothing on the Neolithic Irish. Today we went from the County Meath to the County Louth to experience some of the oldest and most important historical sites in Ireland. We hopped on to our ginormous coach and headed out with our wonderful tour guide, Josephine. 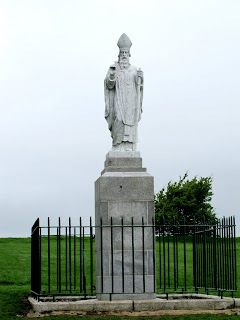 Our first stop was the Hill of Tara. At first glance it doesn't appear to be much more than a grassy hill. However, it happens to be a 5,000 year old meeting place for the high kings of the time. 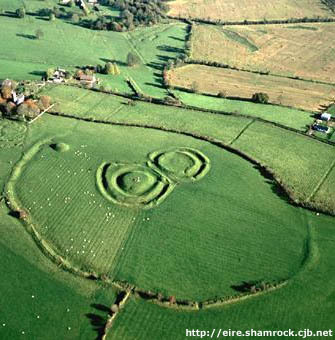 The Hill of Tara is an expansive piece of land that once held residences, a cemetery, and what was called the Banqueting Hall. It was a giant hall that was most likely used for an elaborate processional. This is the Mound of Hostages. Essentially, it was used to hold hostages. What we couldn't see from the outside because there's a gate blocking the entrance were intricate carvings. The site was used continually through out it's 5,000 year, or so, existence by various groups of people. In the late 1700's, the leader of the United Irish Men held gatherings in this sacred place. The United Irish Men fought in the revolution and consisted of Catholics, Protestants, and those from the North and South, which was quite uncommon. It is fairly poetic that they had meetings at Hill of Tara. There is a monument dedicated to the United Irish Men at the Royal Seat area of the site. We also had to dodge what Josephine called "Country Raisins." No, they're not delicious sun-dried grapes. Farmers are still allowed to let their sheep or cows graze the fields. Hey, someone's got to do the up keep. Also on this site was a small church and a statue of St. Patrick. There was also a Sheela-na-gig (pictured below). Sheela-na-gigs were signs of fertility and sometimes depicted, ahem, rather graphic pictures of women on the statues. What you can't really see is a carving of a woman on the stone. Don't worry, we couldn't see it either. Sheela-na-gigs are common in Ireland. Apparently just by touching a Sheela-na-gig, a woman could become pregnant. Needless to say, all of the ladies on the trip took one giant step back. Our next stop was Newgrange. The site is in the Bend of Boyne, which is known to be the first settlement of the Neolithic (Stone Age) people in Ireland. The passage tombs at this site are a remarkable representation of the intellectual and spiritual minds of these people. The Newgrange structures were build before the Great Pyramid of Giza in Egypt, and these guys didn't even have the wheel invented yet. The structure in the picture above is one of three passage tombs built in strategic places in the Bend of Boyne area. Each structure is thought to be about 5,000 years old and to have taken two generations of people to build. 4oo men were needed to build these structures and the people who planned the building most likely never saw it finished. The most amazing part of these tombs is that they were built to line up with the sun. Newgrange, the one above, was built so that on the 21st of December (the shortest day of the year) the rising sun would send a beam shooting through into the passage tomb and illuminating the inside for approximately 17 minutes. 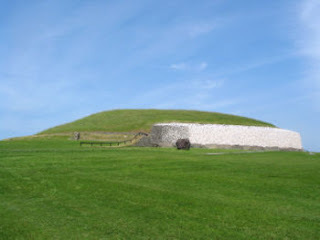 The other two passage tombs, Dowth and Knowth, have the same sort of strategic placement. For Douth the setting sun on the 21st of December sends a beam into the passage. For Knowth, it is the Equinox that provides this sun beam. As the sun rises, it sends a beam into the West side of the structure, and as it sets, it sends a beam into the East side of the structure through another entrance. Our group had a fantastic time exploring these old structures. Here we are, Moms and Dads and we're having a wonderful time! The area around the Newgrange passage tomb was a prime example of Ireland's country beauty. We all enjoyed it very much. Our final stop was Mellifont Abbey. This is the first abbey to have been built in Ireland and was initiated by the Cistercian order. In 1142, the Cistercians came to Ireland to build the abbey and help bring a reform that St. Malachy thought was greatly needed in his country. Sadly, after a great fire in the 1200's, a great residence built on the site, and a great reform led by Henry the VIII, this is all that remains of the Mellifont abbey. The abbey was once one of the richest land owners in the area. The land from Newgrange to Mellifont was owned by the Cistercian order. They rented the land to farmers and the lands were called "granges." The Cistercians had simple lives, but they were intellectuals and engineers. This is a model that represents what the abbey would have looked like in its prime. Sorry for the wordiness of this post, but we saw a lot of amazing things today. There will be more pictures on our Facebook pages. Tomorrow some of us will be able to visit the national library and trace our heritage back to the Irish. Folks here say, "Scratch a little and you'll find the Irish." Until next time. Fabulous photos and commentary....Keep it coming! I'm glad you get to be the trip blogger! Your stuff is really fun to read. Loved seeing pictures and getting explanations of all you visited - and loved seeing a picture of you all even more. Keep them coming!